Virtualization for Windows, Mac, Linux, oh… and Solaris! Check out VirtualBox from Sun. Of course, being a Solaris junkie, I’m excited. This has been out for awhile, but it hasn’t received much press. I’m installing Windows right now on my Solaris machine at work. So far, so good. I don’t care if it’s going to be all that slow, it’ll save me time from dual-booting in the long run. Plus, I can install the various Linux distros I need to work with as well. Very nice! Oh, yeah, and its free. We had an audio problem, but we did get a new episode recorded last night! I’ll be editing it as quickly as I can to get it out to everybody! Does the Web 2.0 benefit only the tech elite? Gawker.com: Does Web 2.0 Benefit Only the Tech Elite? This was interesting in that the blogger points out that we’re so quick to adopt new technologies and new ways to use the Internet, ie Web 2.0, that we’ve caused issues with consuming the tools we have that more tools get invented to handle the new tools. Maybe we should figure out how to fully utilize the tools we have rather than getting invested in creating yet another tool…maybe I’m just old fashioned and think getting a job done well, rather than finding a new job when life gets tough, has some merit. Okay – I want like 10 or so of these. First, I can make my Mac Mini a dual-head box. Actually, I’ll make it a triple head, since I recently upgraded my 17″ LCD to a 20″, making my triple-head setup now all 20″ displays. Then, I’ll make my other three workstations all triple head. Then I’ll make my laptop a quad-head (3 of these plus the laptop display). Scratch all that. I want 30 or so and I want every machine I own to have six heads. I’m gonna need more 20″ LCD displays…. 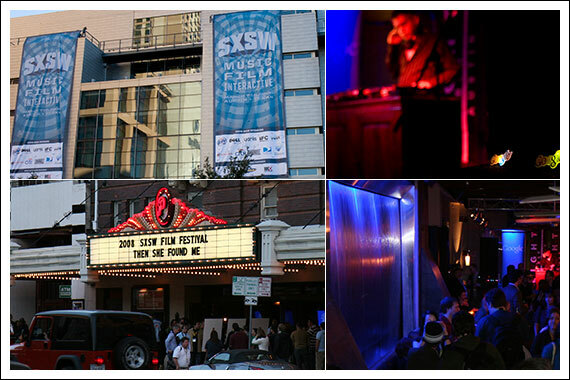 After a great time at this SXSW2008, I must say it is the place to be if you’re in any field of technology. I have been to many conferences, Symposiums and such, but SXSW is by far the best one in recent years. I enjoyed the Music, Film and Interactive festivals. You get to meet interesting people: musicians, filmmakers, actors, producers, geeks, creatives and human-like characters. Mark Zuckerberg interview by Sarah Lacy, twitterers from everywhere exploded badly, but don’t take my work for it, there is a great place where everything is well detailed. I actually think the interview was to generic, it would be great for a business conference, but here you have technology people all gather together, we all know who Mark is, and we had actual technical questions and wanted to hear technical or technology related information. What I was actually glad to see is how open Mark was to talk to people, I had the opportunity to talk with him at the Facebook party. He is a very approachable person. What it was unfortunate is that Apple didn’t send, at Aruns request, anyone from the Safari team. This actually was a let down, but if Apple does not care to send anyone, then they cannot defend themselves, which is their own fault. Apple missed a great opportunity, and probably they thought all of these developers would had been tough on them, as it should be. I was actually impressed by the amount of people with iPhones, and Apple Laptops, definitely the majority, I would like to set a poll or if anyone could bring some statistics back from SXSW, please do. The Google party and the Facebook party were great, I will be posting a few photos of the events and of some sessions. Anyway, if I saw you, talked to you or anything alike at SXSW, please drop me a line. Great events, great nightclubs, great place, Austin. Even though there isn’t any active development on this (last update: 2005-07-09), this is still the best virtual desktop manager I’ve found for Windows. A couple quirks, but so far I’m happy with it. It lets me set up the same keys I use on Mac/Solaris for virtual desktop switching, will switch backgrounds, and even has a text popup of the desktop name when you switch. Its missing some features, but it covers the basics, which is good enough for me. Toshiba has developed a new class of micro size Nuclear Reactors that is designed to power individual apartment buildings or city blocks. The new reactor, which is only 20 feet by 6 feet…can last for up to 40 years, producing electricity for only 5 cents per kilowatt hour, about half the cost of grid energy. Word arrives from The Electronic Frontier Foundation that a crack team of researchers – including the Foundation’s own Seth Schoen – have discovered a gaping security flaw in everyday disk encryption technologies, including Microsoft’s BitLocker as well as TrueCrypt, dm-crypt, and Apple’s FileVault. Granted, it’s possible, but it involves accessing the key from memory during a rather short window.